I have been looking for a large satchel that I can carry comfortably in my hands. In general, I enjoy the ability to just swing a purse on your shoulder. However, every now and then I want to just peruse the mall or go for a walk downtown and look utterly chic. Now don't look at this the wrong way; I know that hobos and shoulder bags in general are chic as well, but carrying a bag by its handles or in the crook of your arm is pure fabulousity. Take a look at the satchel I'm currently coveting. 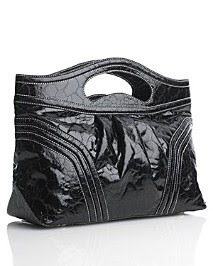 I love the distressed look of the patent leather and its roomy enough to hold all of my essential items. I like the appearance of the leather.